... on schedule and without a hitch. About eight of us author types made it to Bakka Phoenix on Queen Street West Saturday afternoon to give Tesseracts Eleven (edited by Cory Doctorow and Holly Phillips) a proper launch. And what fun it was! We all talked a bit and read a bit, sold a stink of a lot of books and got everyone's name right. As you can see from the picture showing the gigantic crowd, that was no small accomplishment. Karen Fernandez (not in the pictures) snapped these photographs (in addition to the one up top) of the bunch of us. From left to right:Claude Lalumière, David Nickle (me! ), Kate Reidel and Hugh Spencer. Madeline Ashby, Lisa Carriero, Susan Deefholts and Steven Kotowych. For those of you who can't make it to the Tesseracts Eleven anthology launch this coming Saturday November 24 at Bakka Pheonix Books (697 Queen Street West) in Toronto after 3 p.m., but still want to hear me talking too loudly before the Holiday season's done with us, might I commend you to this event: The Merril Collection Christmas Cream Tea. The Merril Collection is, for those who don't know about it, the Toronto Public Library's massive speculative fiction collection, formerly known as the Spaced Out Library. It's one of the most comprehensive collections of sf in North America, and you can read more about it here. 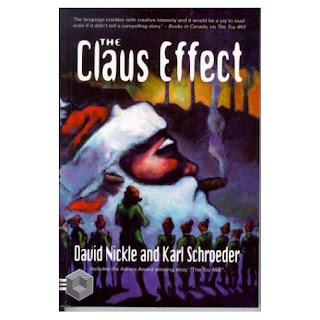 which forms the first part of our novel The Claus Effect (pictured here). ... or is the closest thing that a work of fiction can be to alive - it's available and in print. Tesseracts Eleven (edited by Cory Doctorow and Holly Phillips), the latest edition of the venerable Canadian speculative fiction anthology, is on the shelves, at least here in Canada, and my story "Swamp Witch and the Tea-Drinking Man" (excerpted here) is on the shelves with it. So by all means, if you're an instant-gratification type, rush right out and buy it. If you're one of those people who never buy books if you're not at a party, then stop by Bakka Phoenix Books November 24 and bring some money. That's the Toronto launch, and I'll be there (there being 697 Queen Street West, just west of Bathurst Street, after 3 p.m.) signing books and talking too loudly.